In 1965, Jeremy Thorpe, a Liberal Member of Parliament, must contend with disgruntled ex-lover Norman Josiffe, whom he met in 1961 and had a relationship with for several years. Thorpe had met Norman when the latter was a 21-year-old stable boy in Oxfordshire, and wrote many letters to him, which Norman kept. Norman, who could never quite hold down a job, particularly not after having lost his National Insurance card, was unstable and had a penchant for drama and self-expression, both of which proved increasingly problematic. When Thorpe grew tired of Norman and insisted that he leave the housing he arranged and paid for in London, the young man began to make threats. Thorpe fears exposure and the end of his political career. His fellow Liberal MP, Peter Bessell, keeps Norman silent for the time being with small amounts of money. Norman also requests a new National Insurance card from Thorpe, but his request is denied since it would link Thorpe to Norman. By 1968, Thorpe has been elected as the Leader of the Liberal Party, and is the youngest man to lead the party in a century. He marries naive young Caroline Allpass and they have a baby boy. Norman, on the other hand, has become more unstable. Now going by the name Norman Scott, although he gets on well with horses and dogs, he fails to keep a job or relationship, drinks too much and abuses drugs. He calls Caroline and tells her about his past romance with her husband. She is stunned by this revelation. Caroline dies in 1970, after swerving into on-coming traffic. Thorpe mourns her passing. Bessell moves to the United States to escape his financial troubles. Norman continues trying to get a new National Insurance card and have his story be heard, but with no success. Thorpe considers having him killed, but the plans are postponed multiple times. In 1973, Thorpe marries Marion Stein, Countess of Harewood, and continues to climb the political ladder. Unfortunately, Thorpe encounters Norman by chance, panics, and tells David Holmes (an old friend from Oxford) to arrange for Norman's murder. Andrew Newton is hired for £10,000. He tries and fails spectacularly, only succeeding in killing Norman's dog. Norman immediately reports the crime to the police and is convinced it was ordered by Thorpe. This results in the 1976–1979 Jeremy Thorpe scandal. Newton is put on trial and convicted of attempting to do harm to Norman. Soon afterwards, Norman requests from the police two letters from Thorpe he had given them in the 1960s. Thorpe decides to preemptively publish the two letters himself with his own version of events, and resigns as Leader of the Liberal Party in May 1976. He runs for re-election to Parliament, but loses his North Devon seat to Anthony Speller of the Conservatives. Thorpe, Holmes and two other accused co-conspirators are put on trial for conspiring to murder Norman. Thorpe hires George Carmen, a merciless lawyer, to defend him. In May 1979, the trial gets underway and the media reports its every detail. Norman testifies, explaining that what he mainly wants is his National Insurance card and to have his story acknowledged. Chief Justice Cantley is strongly biased, and sides heavily with Thorpe in his instructions to the jury, which finds Thorpe and his co-conspirators not guilty. The end credits of the miniseries note that Thorpe never holds another public office again. He and Marion remain married until her death in March 2014. Thorpe dies nine months later. Bessell remains in the United States until his death in 1985. Norman is still alive, owns 11 dogs and still doesn't have a National Insurance card. The series was written by Russell T Davies and directed by Stephen Frears, with Hugh Grant starring as Thorpe and Ben Whishaw as Scott. The BBC television drama was first announced on 4 May 2017. The miniseries comprises three 56-minute episodes. Filming took place in London, Manchester, Buckinghamshire, Devon, Hertfordshire, and South Wales. Although scenes were filmed outside the actual Houses of Parliament, the inner courts, interior hallways and staircase were represented by Manchester Town Hall, which is built in the same Gothic Revival style as the Palace of Westminster. The offices of Thorpe and other MPs were created at Bulstrode Park, a vacant country house in Buckinghamshire. The grounds of Bulstrode were also used for the night time assassination attempt scene set on Exmoor. The town of Hertford was used as a stand-in for 1970's Barnstaple, while Saunton Sands in North Devon stood in for the California beach where Peter Bessell (Alex Jennings) lives in a seaside shack. Bridgend in South Wales stood in for Dublin, while Norman's period living in Wales was filmed in and around Monknash. The show was able to film in the actual lobby and exterior of the Old Bailey in London, where the show's climactic scenes take place. A Very English Scandal was the first production ever to be granted permission to film in Court One of the Old Bailey, but they had to decline because of tight time restrictions, and ended up filming the court scenes at a courthouse in Kingston upon Thames. The series premiered on BBC One on 20 May 2018 and on Amazon Prime on 29 June 2018. The DVD was released on 2 July 2018. The miniseries received very positive reviews. On Rotten Tomatoes, the series holds an approval rating of 97% based on 64 reviews, with an average rating of 9.05/10. Rotten Tomatoes's critical consensus reads, "Hugh Grant and Ben Whishaw impress in A Very English Scandal, an equally absorbing and appalling look at British politics and society." Metacritic gives the miniseries a weighted average rating of 84 out of 100, based on 17 critics, indicating "universal acclaim". The real Norman Scott spoke out about the show's characterization of him and its portrayal of his life. He told the Irish News that "Artistic license is fine but this isn't my story. And there's nothing funny about someone trying to kill you...I'm portrayed as this poor, mincing, little gay person ... I also come across as a weakling and I've never been a weakling." ^ Houston, Melinda (15 September 2018). "Hugh Grant thoroughly likeable in new BBC comedy A Very English Scandal". The Sydney Morning Herald. Retrieved 10 January 2019. ^ "The makers and stars of A Very English Scandal discuss why comedy is so important to the story". Radio Times. Retrieved 10 January 2019. ^ "The Riveting Tragicomedy of 'A Very English Scandal'". Film School Rejects. 23 July 2018. Retrieved 10 January 2019. ^ TV, What' s on (20 May 2018). "Ben Whishaw on playing Norman Scott: 'A Very English Scandal rips along like a bizarre comedy!'". What' s on TV. Retrieved 10 January 2019. ^ Gilbert, Sophie (3 July 2018). "'A Very English Scandal' Revisits an Affair That's Stranger Than Fiction". The Atlantic. Retrieved 10 January 2019. ^ Mangan, Lucy (20 May 2018). "A Very English Scandal review: funny and confident – like Jeremy Thorpe". The Guardian. ISSN 0261-3077. Retrieved 10 January 2019. ^ "A Very English Scandal". BBC Media Centre. BBC. 9 May 2018. Retrieved 3 June 2018. ^ a b Lowry, Brian (29 June 2018). "Hugh Grant delivers in Amazon's brilliant 'A Very English Scandal'". CNN. ^ a b c d Eleanor Bley Griffiths (3 June 2018). "Where is A Very English Scandal filmed?". Radio Times. Retrieved 18 January 2019. ^ a b Joanne Kavanagh (3 June 2018). "Where's A Very English Scandal filmed? Filming locations in Hertford and Devon revealed". thesun.co.uk. Retrieved 18 January 2019. 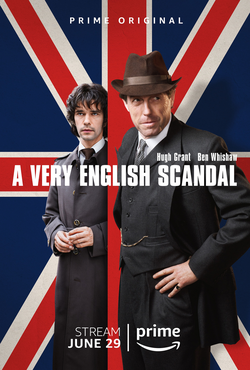 ^ "A Very English Scandal - DVD Release News". 27 June 2018. ^ "A Very English Scandal: Miniseries (2018)". Rotten Tomatoes. ^ "A Very English Scandal". Metacritic. ^ "Norman Scott criticises 'weakling' portrayal in BBC's A Very English Scandal". The Irish News. 6 May 2018. Retrieved 28 May 2018.